Westpac Consumer Confidence for Friday to set the tone for the Aussie. The advance could continue short-term but given RBA's stance are unlikely to last. The American dollar led the way through the FX board this Tuesday, rising against most rivals to give up mid-European morning and closed the day in the red. The AUD/USD pair fell to 0.7077 and recovered up to 0.7102, with the upside limited by worse-than-expected Australian housing data released at the beginning of the day, as Home Loans plummeted 6.1% in December and Investment Lending for Homes declined by 4.4% in the same month. The NAB confidence indexes showed an improvement in January, although the report indicated that there which made the bank say that there's now a greater probability that the RBA will cut rates. Australia will release during the upcoming session the Westpac Consumer Confidence Index for February, previously at -4.7%. The RBNZ is having a monetary policy meeting, which could have a temporary effect on the AUD/USD pair. 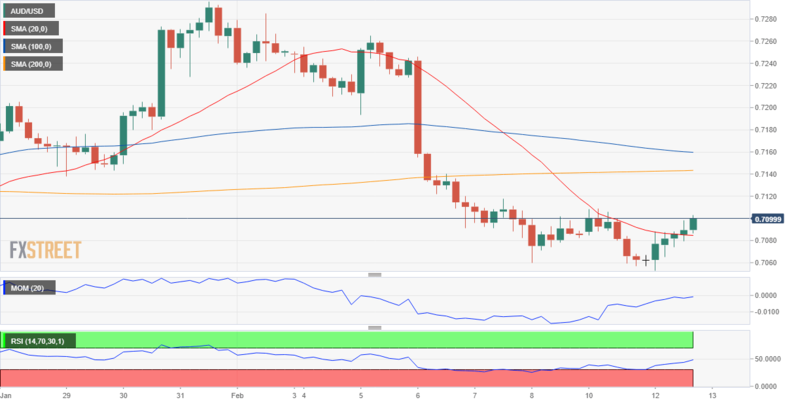 Technically the upward potential remains well-limited, as in the 4 hours chart, the pair is hovering around a directionless 20 SMA and below the larger ones, while the Momentum indicator lacks directional strength, heading nowhere around its mid-line and the RSI advances but at around 46. The upward correction could gain momentum only if bulls manage to trigger stops above 0.7145, while renewed selling interest which leads to a decline below 0.7030 should signal a bearish continuation ahead.